Channel 4: please come to Yorkshire. That's the unanimous message of a new campaign launched by Leeds City Region. #4Sparks - which has also been backed by Screen Yorkshire - represents an "unprecedented show of solidarity and determination to support" the broadcaster's move to the county. Although the broadcaster has so far opposed a move away from London, Culture Secretary Karen Bradley has said it must establish a “major presence” outside the capital. And Leeds City Region claims Channel 4 could "spark a revolution in the creative and screen industries" in Yorkshire. 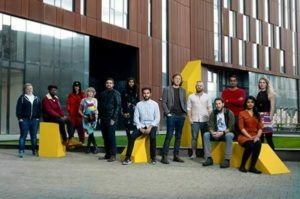 Roger Marsh OBE, chair of the Leeds City Region Enterprise Partnership (LEP), said: “There’s a real momentum here and I’m delighted the young creatives of the region have come together to champion the #4Sparks campaign, demonstrating that we offer a distinctive voice for Channel 4. We all know that the region is on the cusp of a real transformation and Channel Four are the spark, the opportunity that could lead that revolution.